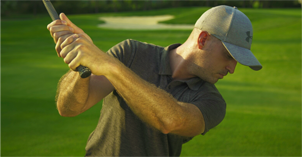 I’m going to show you how to shallow the club, give you some key checkpoints, and a drill to use so you can start hitting the golf ball a lot longer and straighter next time you go play. When we’re giving golf lessons, oftentimes we’ll draw that line that produces a plane in space. The best golfers who hit the ball the farthest and straightest, that club head and club would work up that plane line, pretty much on it or parallel to it, and would start to work right back down on that plane line. If you could imagine a perfect plane or a perfect circle around my body, they wouldn’t deviate much from that line, both back or down. Now, that’s perfect in utopia for them, but for us, sometimes we go off that line a little bit. The more common error off that line would be during the downswing, above the line, or you’d be over that line or over the top, and that’s killer, both for direction and, mostly, for distance. 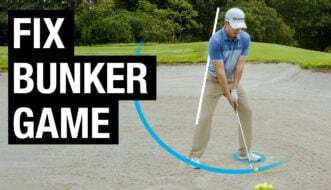 Watch the video to see my recommendations so you can start hitting longer and straighter drives.